Viktor Arvidsson scored a hat trick on National Hat Day, and the Nashville Predators routed the Washington Capitals 7-2 Tuesday night, the Caps' third straight loss and sixth in their last nine games. NASHVILLE, Tenn. (AP) — Viktor Arvidsson is feeling healthier with each passing game, and the results are showing in the back of the net. 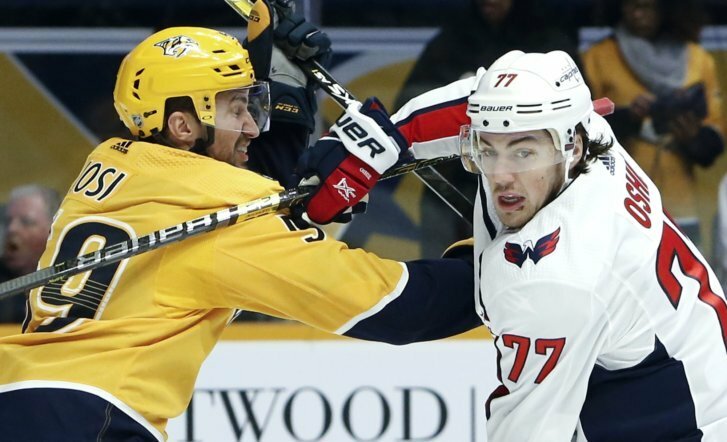 Arvidsson scored a hat trick on National Hat Day, and the Nashville Predators routed the Washington Capitals 7-2 Tuesday night to snap a two-game skid. He could’ve had more, too. Nashville coach Peter Laviolette said Arvidsson hit a post and missed a couple other opportunities in close. Arvidsson scored the opening goal of the game and added two more in the second period for the second hat trick of his career. He has nine goals and two assists in 11 games since returning Dec. 27 from a broken thumb. The Predators have earned points in eight of those games. Bonino scored twice, and Rocco Grimaldi and Calle Jarnkrok each added a goal as 12 players contributed at least one point for the Predators. They set a season high for goals, topping the six they scored Dec. 31 in a win at Washington, the defending Stanley Cup champion. Braden Holtby dressed for Washington but missed his second consecutive game after being poked in the eye during a loss to Columbus on Saturday. Capitals coach Todd Reirden said the team found out just hours before the opening faceoff that Holtby wouldn’t be able to play. That left Pheonix Copley starting his second game in two nights, and the Capitals have lost three straight. Reirden wasn’t happy with some poor puck management and odd-man chances allowed. He did like how his team finished, blocking shots down 7-1. “I’m very proud of the fact that not one single guy quit or stopped playing ’til the end of that game,” Reirden said. Arvidsson scored on a partial breakaway 3:45 in, beating Copley just below his glove. Bonino finished off a cross-ice pass from Colton Sissons for a 2-0 lead midway through the first. Then Arvidsson started a four-goal second, tipping in a shot by P.K. Subban 1:21 into the period. Backstrom pulled Washington to 3-1 at 7:07, and the Capitals appeared to have momentum after hitting a couple of posts and going back on the man advantage when Jarnkrok tripped Oshie. But Arvidsson broke away and slid the puck under Copley’s pads for a 4-1 lead that had fans tossing hats onto the ice at 12:08. That wasn’t all. Grimaldi finished off his goal with a spinning backhander , and Bonino tipped in his second with 5.8 seconds left in the period to make it 6-1. Jarnkrok padded the lead at 7:56 of the third. Laviolette hasn’t really paired captain Roman Josi and Subban, the 2013 Norris Trophy winner, together much. They played together against Washington, and Laviolette said they did a good job. “We’ll probably leave it that way,” Laviolette said. NOTES: Laviolette has 599 career wins as a coach. … The Predators have a franchise-record five hat tricks this season, all by different players. Arvidsson joined Filip Forsberg, Sissons, Jarnkrok and Austin Watson. … Ekholm’s assists gave him a career-high 36 points this season. … Nashville improved to 22-2-1 when scoring first. … Oshie skated in his 700th career game. Capitals: Host the New York Islanders on Friday night. Predators: Host the Winnipeg Jets on Thursday night.